I was fortunate to attend the “Building a Pathway for Student Learning” Course Design Retreat June 2-5, 2015 in Colorado Springs. The retreat is a joint effort offered each year with faculty from both Regis University and the United States Air Force Academy. The hands-on approach to course design created a fun and interactive learning community. I was a facilitator for one of the five tables of intermingled faculty. This role provided me with the opportunity to gain insights into the difficult “thinking processes” that it takes faculty to craft a well-integrated, aligned, and transparent course. The following is a summary of what I learned and observed. There are five phases within the course design’s “thinking process,” each with attention to requisite knowledge, skills and attitudes (KSAs) students must gain in order to be successful in the course. First is identification of “student learning factors.” Second is the formulation of a well-crafted and measureable “learning goal.” Third is the identification of the “proficiencies” student must gain in order to achieve the learning goal. Fourth is the development of appropriate “learning experiences” that support students in moving toward the proficiency and ultimately the learning goal. Fifth is the identification of appropriate formative assessments for both students and faculty to determine if students had gained the requisite knowledge, skills and attitudes to gain the needed proficiencies. Faculty were instructed to come with a course in mind to either create or revise throughout the retreat. The focus was on “student learning” rather than on content development. This may sound like a minor difference in wording, but it was a major shift in how faculty approach the course design process. The goal of the retreat was to facilitate faculty through their thinking processes in order for each to craft a well-integrated, aligned, and transparent course. A “Course Poster” template was used to facilitate each phase. Throughout the retreat the faculty progress through an iterative refinement of their “thinking process.” These refinement processes provide the faculty with the opportunity to revisit any assumptions they may have made about the student learning factors without realizing it. Often, assumptions impact the student learning factors and targeted learning goal. One of the key aspects of the retreat was the iterative refinement of the thinking process with input and feedback from peers. This was crucial to allow for different perspectives from other faculty who are not familiar with the course content. Often faculty are so familiar with their content that they fall into the “Curse of Knowledge.” They forget all of the proficiencies that they have to learn and assimilate to build their wealth of knowledge of the content area. Phase 1: The faculty begin by brainstorming a list of student learning factors for their courses such as diversity motivation to learn, cultural backgrounds, background experiences and many other factors to consider. Faculty moved from identifying “who are my students” with a continuous refinement of the student learning factors to formulate “what do my students need to learn” in order to meet the learning goal. This initial phase begins to build the pathway for student learning. Phase 2: The faculty were instructed to identify the learning goals but to pick one to focus on throughout the retreat. The learning goal served as the bulls-eye target for the course design process. Notice that I am not saying content development process. All aspects of the course design process had to align with their selected learning goal. If everything didn’t align, there was a mismatch of what students needed to learn, practice, and do (KSA) to meet the learning goal. Throughout the retreat there was an ongoing refinement of the learning goal and the student learning factors to make sure that the targeted learning goal aligned with what students needed to know, do or value (KSA) in order to meet that learning goal. The next step within this second phase was to identify what type of summative assessment would be appropriate for the selected learning goal. Identifying the summative assessment at this point in the thinking process provided continuity of thought and alignment with the learning goal. If the summative assessment didn’t accurately measure the student’s learning related to the course goal, then the summative assessment needed to be revisited and potentially the learning goal as well. Phase 3: This phase in the course design process was to identify all of the proficiencies (KSA) that students must gain within the course in order to meeting the targeted learning goal. Another way of thinking of proficiencies is as learning objectives or outcomes. Faculty then brainstorm with their peers and facilitator to identify all of the student learning proficiencies needed. This thinking process further refines the course design since the proficiencies have to align with both the student learning factors and the learning goal. If the proficiencies don’t align then more thinking and brainstorming will be needed. At this point in the retreat the faculty seemed to gain confidence in their thinking process around course design. Faculty seemed to pick up their momentum and enthusiasm for how they were designing their courses that would indeed build a pathway for student learning. Phase 4: Faculty moved on to identifying learning experiences (not the assignments themselves) which support student learning for each of the proficiencies identified in Phase 3 as they kept in mind the KSAs students need to develop. As an aside, this is where I often see faculty spend most of their time on course development. Phase 5: Faculty then move on to the last phase by brainstorming and identifying appropriate formative assessments for each of the proficiencies. This part seemed hard and simple at the same time. The thinking process that was required to determine appropriate evaluations for each of the proficiencies was simple though more creativity was encouraged. In turn, each of the formative evaluations identified needed to align with the summative assessment. This was the harder part of the thinking process. For example, if the summative assessment was an essay, then one of the formative assessments needed to be some type of an essay to provide students with the opportunity to have their writing skills evaluated prior to the summative assessment. At the end of the retreat faculty presented their Course Poster and discussed their rationale for how they mapped the pathways for student learning clearly identified. 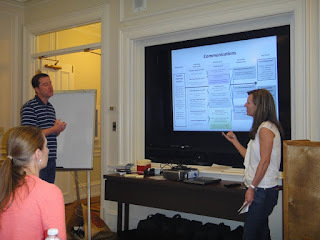 There were many ah-ha moments as faculty wrestled with the complexity of their own course design in order to ensure that they built a pathway to set students up for success in their courses. The course poster provides transparency for their course design and shows the integration of the five phases. Faculty discussed whether they would share their course poster with their students or not. The jury is still out on this one. My appreciation and gratitude goes to Ken Sagendorf in the Center for Excellence in Teaching and Learning (CETL) for the opportunity to participate in this course design retreat. I will use this course design framework to help me as I work with faculty moving forward. I believe this is a wonderful process to pull apart a course and fit it back together (like a puzzle) in a more cohesive and aligned manner. I am grateful to my department, Instructional Design & Technology (IDT) for their support of me in attending this retreat. My hope is to share what I’ve learned with my colleagues and that we may all focus more on student learning rather than primarily on course content development.